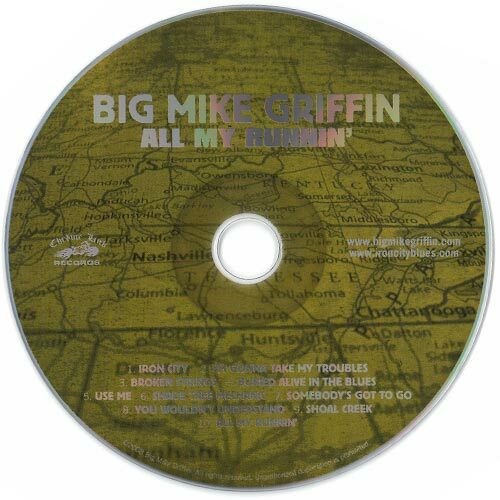 The latest CD "All my runnin" by Big Mike Griffin, Recorded in December 2007, is the 6 th release for Chromelink Records artist Big Mike Griffin. 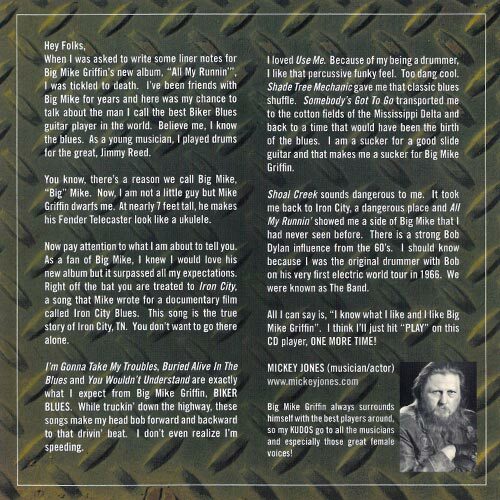 When I was asked to write some liner notes for Big Mike Griffin's new album, "All My Runnin'", I was tickled to death. I've been friends with Big Mike for years and here was my chance to talk about the man I call the best Biker Blues guitar player in the world. Believe me, I know the blues. As a young musician, I played drums for the great, Jimmy Reed. You know, there's a reason we call Big Mike, "Big" Mike. Now, I am not a little guy but Mike Griffin dwarfs me. At nearly 7 feet tall, he makes his Fender Telecaster look like a ukulele. Now pay attention to what I am about to tell you. As a fan of Big Mike, I knew I would love his new album but it surpassed all my expectations. Right off the bat you are treated to Iron City, a song that Mike wrote for a documentary film called Iron City Blues. This song is the true story of Iron City, TN. You don't want to go there alone. 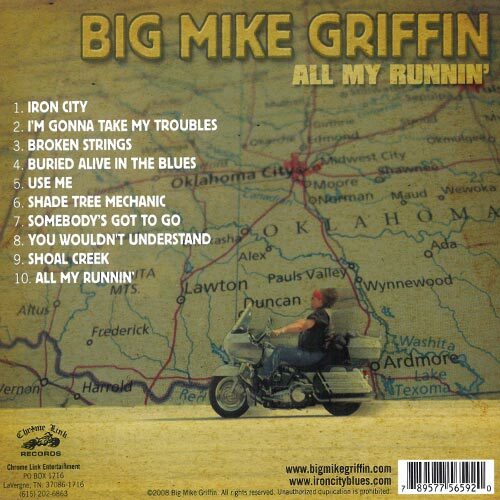 I'm Gonna Take My Troubles, Buried Alive In The Blues and You Wouldn'tUnderstand are exactly what I expect from Big Mike Griffin, BIKER BLUES. While truckin' down the highway, these songs make my head bob forward and backward to that drivin' beat. I don't even realize I'm speeding. I loved Use Me. Because of my being a drummer, I like that percussive funky feel. Too dang cool. Shade Tree Mechanic gave me that classic blues shuffle. Somebody's GotTo Go transported me to the cotton fields of the Mississippi Delta and back to a time that would have been the birth of the blues. I am a sucker for a good slide guitar and that makes me a sucker for Big Mike Griffin. Shoal Creek sounds dangerous to me. It took me back to Iron City, a dangerous place and All My Runnin' showed me a side of Big Mike that I had never seen before. There is a strong Bob Dylan influence from the 60's. I should know because I was the original drummer with Bob on his very first electric world tour in 1966. We were known as The Band. 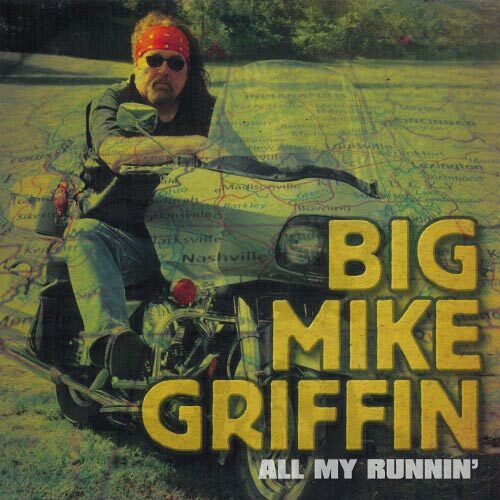 All I can say is, "I know what I like and I like Big Mike Griffin". I think I'll just hit "PLAY" on this CD player, ONE MORE TIME! Big Mike Griffin always surrounds himself with the best players around, so my KUDOS go to all the musicians and especially those great female voices! Mike Johnson - Steel guitar on "All my Runnin'"
The songs "Iron City" and "Shoal Creek" appear in the documentary " Iron CIty Blues"
This album is dedicated to the people that left us too soon, and didn't get all their runnin' done. And all the brothers and sisters of the road that have gone to a better place. They are loved and missed!